HTC smartphones have been adding interesting camera-based features for a few years now. There was the switch to UltraPixels with the HTC One M7 and then the addition of the Duo Camera depth sensor for the HTC One M8. It makes sense then, that the Taiwanese company would look to capitalize on the popularity of the selfie. Other companies are already moving in this direction; Sony and Samsung introduced the Xperia C3 and Galaxy Grand Prime respectively this year, each with a front-facing 5MP camera while Huawei has an 8MP selfie snapper on the Ascend P7. Now, HTC has unveiled the HTC Desire Eye, a new upper mid-range phone from HTC with dual 13MP wide-angle shooters. So, what's the deal with this brand new handset? HTC officially revealed the Desire Eye on October 8 (as of this writing), but not yet a price or release date. So, we're projecting a release date set for mid-November. It's unlikely that HTC will want to miss out on the selfie-central Christmas holidays after all. If HTC's new phone is indeed the Desire Eye then it will sit beneath the One series of phones when it comes to the company's pricing structure. However, given some of the specs we're seeing, it will likely cost more than the £299 (around $480, AU$550) HTC Desire 816. Interestingly, a shipment record, spotted by TalkAndroid.com, rumors the Desire Eye's price at 21,490 INR (Indian rupees) which equates to roughly £220 ($350, AU$401). The big news about the HTC Desire Eye is the inclusion of dual 13MP cameras, each with dual LED flash. Both shooters offer 1080p HD video recording through their wide-angle lenses. The rear lens touts an f2.0 aperture, while the front isn't far behind at f2.2. Of course, the big focus here is on photography, and the Desire Eye certainly offers that in spades. Camera fans will also be pleased to note the presence of a dedicated shutter button on the right hand side of the handset. Plus, HTC's Zoe app is featured on the Desire Eye in full force, not to mention that the app itself is expanding to iOS later this year. Think of this goofily-named suite of apps and features as HTC's new set of photo and video software tools designed to unleash the Desire Eye cameras' full potential. Features like face tracking keep users in frame and up to other four people appropriately positioned during a video chat or conference call. Think of it like a built-in Google Hangouts interface ... or like a Brady Bunch feature. A screen sharing function brings some desktop capability to a palm-sized device. Now, don't go thinking that you'll only get to use one of those overpowered, 13MP shooters at a time. Split Capture lets users split-screen shots taken with the front and rear snappers, giving some context to your duck lips or whatever your preferred selfie-face happens to be. Voice Selfie allows you to activate front lens capture by uttering, "say cheese" or "smile." Video recording can be initiated in the same fashion by saying, "action" or "rolling." The HTC Desire Eye comes packing a 5.2-inch Full HD display, meaning it already out-muscles the 4.7-inch Full HD display on last year's HTC One. Bringing a Full HD display to the Desire range is the logical next step for HTC. The Desire 816 used a 1,280 x 720 panel with a 267 ppi that couldn't compete with a 1080p display. Given that the Desire Eye is, above all else, a camera phone, the move for full HD makes complete sense. The HTC Desire Eye definitely runs on Android, but HTC is playing coy on which version exactly. But we expect Android KitKat out of the box with HTC's Sense 6 overlay in place, the latter at least being a definite. This means that, like other HTC devices, the Eye boasts the newsy HTC BlinkFeed app. 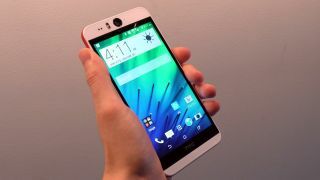 Although the HTC Desire Eye is largely a mid-level handset, the phone sports some impressive specs that, depending on the price, could make the phone a really attractive proposition. The HTC Desire Eye comes packing a quad-core, 2.3GHz Snapdragon 801 processor, backed by 2GB of RAM and with 16GB of native storage. That's the same internal specification as HTC's current flagship, the HTC One M8, save for the storage space. However, the Eye runs on a 2400mAh battery, whereas the M8 has a 2600mAh one. What's more, the new phone comes touting an IPX7 limited waterproof rating. Although specifications are similar to HTC's flagship, the design language of the chassis is very much of the Desire family. Judging from our hands on review, HTC has gone with a polycarbonate casing, rather than the mined aluminum used for the HTC One M7 and M8. So far, we've seen two different color options - red/white and light blue/dark blue. Whether or not HTC has more in the pipeline remains to be seen. Keep it locked to this space as we learn more about this interesting, self(ie)-interested handset from HTC.